Welcome to our 2018 Champaign-Urbana Memorial Day Weekend Planner, Sponsored by University of Illinois Athletics. Fighting Illini Volleyball is hosting their Overnight Skills Camp July 13-15 and July 16-18. Register now! It’s the unofficial start of summer in Champaign-Urbana! To help you plan out your errands, we have a list of what is open and closed on Memorial Day. Staying home this weekend? We have 5 Things To Do as a Family on Memorial Day Weekend. We can’t wait for area Pools to Open, and don’t miss the grand opening of the updated Hessel Park Splash Pad! In case the weather doesn’t cooperate, we also have a list of 8 Free Air-Conditioned Indoor Family Outings in Champaign-Urbana. Want to take your family on an impromptu camping trip? Our readers recommend their favorite family camping spots. Boating more your style? We have recommendations for that as well. Want to kick off the summer with ice cream? Take the family on our Ice Cream Trail. Thanks again to University of Illinois Athletics for sponsoring our Weekend Planner. When: Thurs., May 25, 5:00-10:00 p.m.; Fri., May 26, 8:00 a.m.- 11:30 p.m.; Sat., May 27, 6:30- 11:00 p.m.
How much: Free; food and good for sale; rides are ticked. Why you should go: It’s one of the first festivals of the season! Town-wide garage sales, family amusements, music and more. Bring the family to the Farmer City Raceway on Friday, or check out first annual frog jumping contest on Saturday at noon. Why you should go: Dive in! 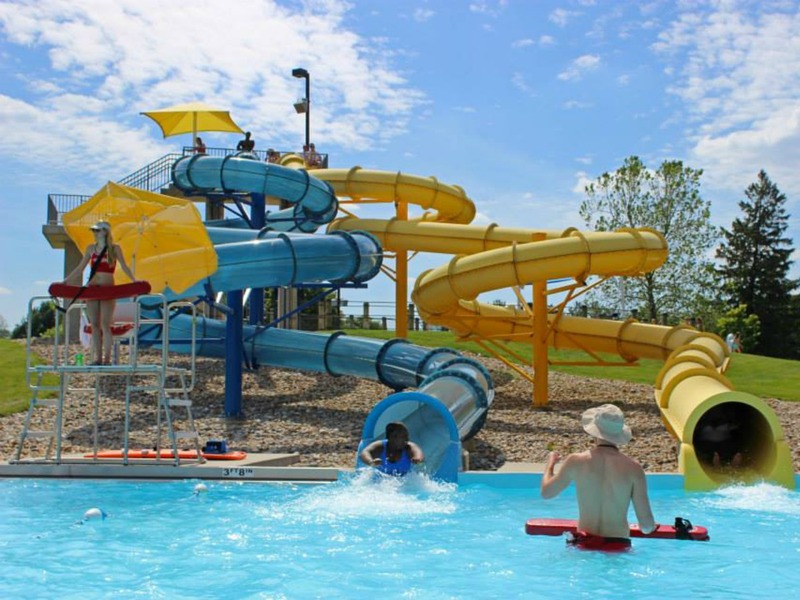 The Urbana Park District’s Crystal Lake Park Family Aquatic Center opens May 26, the Champaign Park District’s Sholem Aquatic Center opens May 26 and you can find many other pools opening this weekend. Also opening this weekend, the newly refurbished Hessel Park Splash Pad. Pssst: Don’t forget the sunscreen! When: Open daily starting Sat., May 26, 1:00 -7:00 p.m.
Why you should go: The farm features traditional farm animals such as sheep, pigs, goats, horses, cows, chickens, and geese. Pet the animals from 3 to 5 p.m. (remember to bring your closed toe shoes). This is a Champaign-Urbana tradition! A must for anyone with young children. For more places to see animals up close in Champaign-Urbana and beyond, see our post. When: Sat., May 26, 9:00 – 11:00 a.m.
Why you should go: Bring your family and friends to the forest preserve for some free fishing fun! Kids activities, awards, and more! Basic fishing instruction will be available. The Illinois fishing license requirement will be waived for this event. Fishing poles are available to borrow, but you are welcome to bring your own. Bait provided. Adult supervision of children 15 and under is required. For more free fishing fun, see our post. Return to the Middle Fork River Forest Preserve (or make weekend plans to family camp!) on Sunday, May 27, at 5:00 p.m. for a Memorial Day Parade at the Campground. When: Sun., May 27, 2:00 – 3:00 p.m.
Why you should go: Enjoy the first sounds of Summer with the breezy, beachy tunes of Kittens Incorporated, featuring local musicians Bryan and Jolee Phelps. When: Sun., May 27, 6:00 – 8:00 p.m.
Why you should go: The Sounds at Sunset Concert Series continues this Sunday at Powell Park featuring Cosmology. Don’t forget to bring your lawn chairs, picnic, and bug spray! For more events, as always, check our Champaign-Urbana family-friendly events calendar, presented by Busey Bank.